Clothing/Jewelry Description A black t-shirt with "CSI" in green lettering and a handprint image on the front, size 7 black cargo pants, white Hanes athletic socks and worn size 11 black Sketchers sneakers with orange trim. Medical Conditions Kyron is allergic to bee stings. Distinguishing Characteristics Caucasian male. Brown hair, blue eyes. Kyron wears metal-framed eyeglasses. Kyron was last seen in Portland, Oregon on June 4, 2010. He usually rode the bus to Skyline Elementary School, where he was a second-grader. The school is in the 11500 block of Skyline Boulevard in a rural area in northwest Portland, about two miles from Kyron's home in the 15700 block of Sheltered Nook Road. His stepmother, Terri Lynn Moulton Horman, stated she drove him to school because there was a science fair that day and Kyron wanted to set up his exhibit, a display about the Red-Eyed Tree Frog. They arrived shortly after 8:00 a.m. and dropped Kyron's coat and backpack off at his classroom. A witness saw Terri and Kyron together at 8:15 p.m., in front of Kyron's exhibit. The bell rang at 8:45 a.m. and Terri says she left then. She said Kyron told her he was going to his classroom. He has never been heard from again. 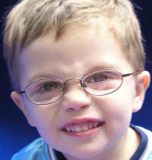 Terri reported Kyron missing at 3:45 p.m., after he failed to arrive home at 3:30 p.m. as scheduled. No one reported having seen Kyron at the school after the 8:45 bell. His teacher marked him absent after classes began at 10:00 a.m.; she thought he was at a doctor's appointment. Because so many hours had passed since he was last seen, police launched an extensive search immediately. Over the next few days they interviewed all the students and staff at Skyline Elementary School and searched the school, school grounds and the surrounding area. It was one of the largest searches in Oregon history. Kyron's loved ones described him as timid and stated he would be unlikely to leave the school and go off on his own. 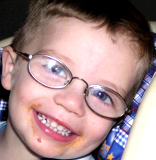 Kyron's parents, Kaine Andrew Horman and Desiree Young, have been divorced since 2003. Terri and Kaine married in 2007, but they had been together for several years before that. Terri raised Kyron from infancy, although he did visit with Desiree and his stepfather, Tony Young, every couple of weeks. Kaine and Terri had a one-year-old daughter, Kiara Ariel Horman, at the time of Kyron's disappearance, and Terri has a teenage son from a previous marriage who was living with her parents in June 2010. Photos of Kaine, Terri and Desiree are posted with this case summary. Less than two weeks after Kyron's disappearance, police stopped the search and announced they had upgraded his case from a simple missing child to a criminal investigation. At the same time, they stated they didn't think Kyron had been abducted by a stranger. They focused on Terri, stating cellular phone records indicated she wasn't where she said she was on the day of her stepson's disappearance. Three weeks after Kyron's disappearance, on June 26, Kaine moved out of the family home. That same day, Terri placed two 911 calls from their residence. The first one, at 5:17 p.m., was classified as a "threats" call, and the second, at 11:39 p.m., was classified as a "child custody" call. Kaine wasn't home when either call was placed. During the following days, the police released more information to the public: a landscaper who worked for the Horman family had told investigators that about six or seven months before Kyron disappeared, Terri offered him money to kill her husband. When authorities notified Kaine of this, the news prompted to him to take Kiara and move out. The police attempted a sting, bringing the landscaper to Terri's door to demand money while undercover agents watched from nearby, but Terri called 911 instead to say someone was demanding $10,000 from her. Kaine filed for divorce and a restraining order from Terri, saying he and the police believed she was responsible for Kyron's disappearance in addition to the attempted murder-for-hire. A judge barred Terri from contacting Kaine, Kyron, Kiara or her own teenage son. Kaine sought custody of Kiara and child support from Terri. He accused Terri of attempting to abduct Kiara from her day care two days after the restraining order was granted, of beginning an affair with another man four days after Kaine moved out, and of sharing sensitive information, including Kaine's new address, with the man. In mid-July, Terri moved to her hometown of Roseburg, Oregon and Kaine and Kiara moved back into their Portland house. Investigators questioned Terri's friend, DeDe Spicher, about her possible knowledge of Kyron's disappearance. They searched her home and asked the public if they had seen Terri, her white pickup truck or Spicher on June 4 between 9:45 a.m. and 1:00 p.m. Spicher stated knew nothing about Kyron's disappearance and she believed Terri was innocent of any wrongdoing. Kaine stated Terri suffered from postpartum depression after Kiara's birth and her behavior changed. In court documents, he claimed she is an alcoholic, has a personality disorder and is "severely emotionally disturbed." Kaine said he believed Kiara was not safe with her mother and may have witnessed whatever happened to Kyron on the day he disappeared. Some of Terri's acquaintances reported that she was angry with Kaine for making her teenage son move out of their home, which he did in February 2010, four months before Kyron's disappearance. Desiree told reporters that she had attempted to get custody of Kyron prior to his disappearance and that Kyron had told her several times that he wanted to come live with her. In May 2012, Desiree filed a lawsuit against Terri, accusing her of kidnapping Kyron and seeking $10 million in damages. She has asked the court to order Terri to return Kyron, or say where his body is. The Hormans' divorce is pending. Authorities have yet to name a suspect in Kyron's disappearance, in spite of their focus on his stepmother. Kaine speculated Terri caused the child's disappearance in an effort to hurt him, and suggested she may have had help from other individual. Both of Kyron's parents continue to hope that he is alive. His case remains unsolved. Updated 8 times since October 12, 2004. Last updated October 15, 2017; age-progression updated.